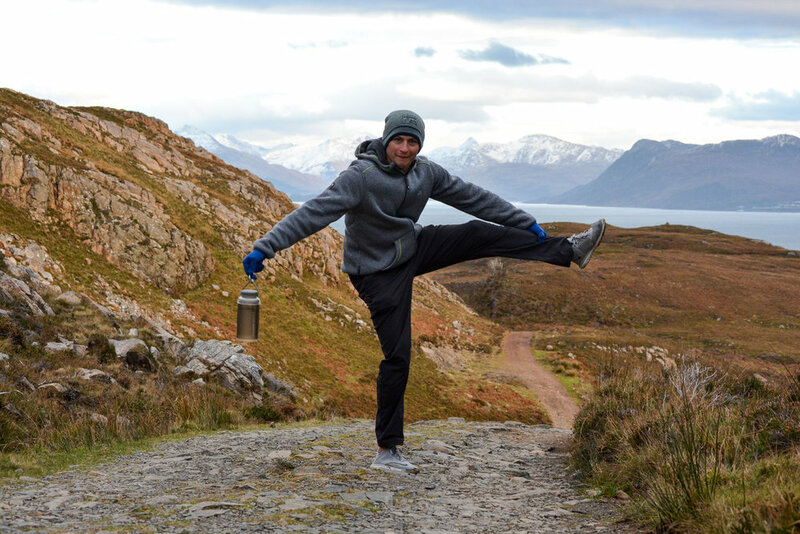 When researching what to do in Scotland after hiking the West Highland Way, I immediately thought of one of my closest friends, Melanie, who had just gone on her honeymoon there. 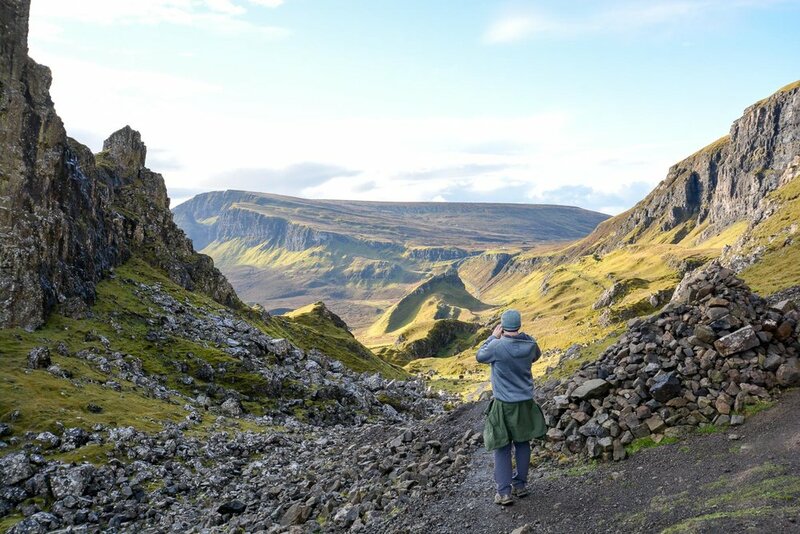 She suggested Isle of Skye, and I can’t thank her enough for that recommendation—we loved it! 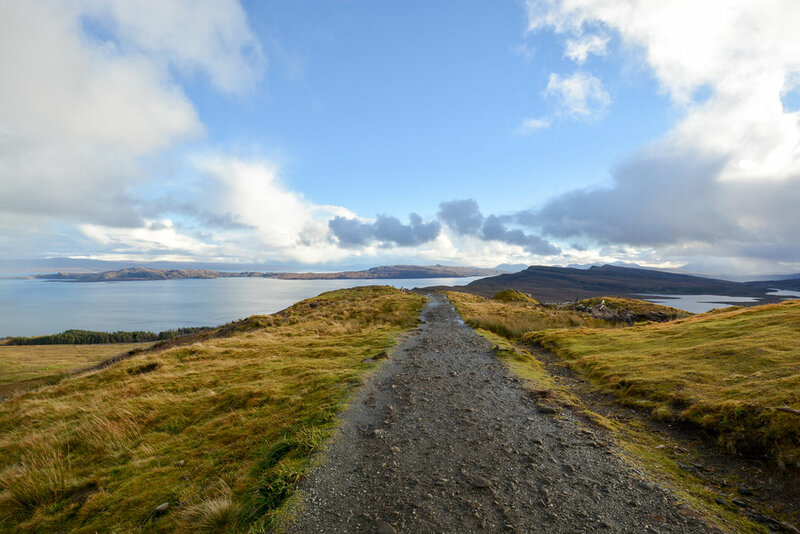 I didn’t think I could be in more awe of Scotland’s natural beauty after 8 days of hiking in the highland mountains, but we were pleasantly surprised how we kept falling in love with Scotland more and more while touring the Isle of Skye. We were even there at the beginning of low season, November, so we were expecting terrible weather, but got lucky with only having a few short rainfalls that barely tampered with our plans. On the drive to the Isle of Skye we made a pit stop at the Eilean Donan Castle. This castle is from the 13th century and mostly intact! It’s striking as you drive up to it as the castle itself is on an island surrounded by a lakes. You can explore both the inside of the castle and its surrounding grounds. We arrived just at closing time, so we unfortunately could not go inside. Misty Isle Boat Trips — One thing we wanted to do was take a full day boat trip. These boat trips offer a chance to see puffins, seals, and hundreds of dolphins, followed by a chance to explore and hike around the Cuillin Mountains. Unfortunately, these boat trips are done seasonally, so by the time November rolled around there were none available. If you’re going to the Isle of Skye, however, I would definitely recommend making room in your itinerary for this trip. Hike to Sandy Beach — This was our alternate plan, and it still did not quite go accordingly to plan. I would suggest waterproof shoes or shoes you don’t mind getting muddy for this hike (if going in the rainy season). The hike is short and easy, about 3.5 miles there and back, but the beach looks like it belongs in the Caribbean. We got a few pictures, but were unable to reach it due to the amount of mud. The sand is white and the water is incredibly clear, perfect for a beach day with the gorgeous Scotland mountains as your backdrop! The drive to Sandy Beach offered gorgeous Highland Mountain views! This was another bay, not Sandy Beach, but what amazed me was how turquoise the water was! Visit Cuillin Brewery — Bryan and I did not have time to stay at the Brewery or grab a pint on tap at the restaurant next door, but we did grab a 4 beer sample pack (4 very large beers, which came with a free bottle opener—woo!). We tried and surprisingly thoroughly enjoyed each beer we tried, even though they were all different. Walk Around Portree — We stayed in the town of Portree, which is quaint and full of small shops. We had fun sipping some coffee and walking around the town in the morning. It can’t hurt that the lake the town is adjacent too is so picturesque. We stayed at the Portree Hostel, which was clean and sociable. We actually ran into someone we met on our West Highlands Way hike! ﻿Neist Point Lighthouse — The second day we got an early start and drove to the Neist Point Lighthouse. The drive there was scary to say the least. The road was narrow and full of blind curves and hills, but us and our rental car made it through scratch free! The lighthouse itself was not open, but you could walk around the grounds which offered breathtaking and daring views of the giant cliffs. Fairy Pools — We then attempted to see the very well known Fairy Pools. Once we arrived to the parking lot (or car park as they call it in the UK), a man told us it would cost about 5 pounds to park. It was only about a 10 minute walk to the pools, but we considered paying as the money went towards upkeep of the trails, parking lot, and soon-to-be-built bathroom facilities. Of course as we were pulling into our parking space a downpour began, quickly joined by hail. We decided to skip the pools and go to our next destination—the distillery. Talisker Distillery — The Talisker Distillery is the oldest working distillery on the Isle of Skye. We pulled up to the distillery and the smell of barley immediately filled our nostrils as we walked into the tasting room to book our tour. The distillery is very popular, even in low season, so they recommend you booking your tickets ahead of time online for the tour. We arrived just before the rush and were able to book our tour right then and there. The tour was very informative, and it definitely made us appreciate the precise art of making scotch whiskey. At the end of the tour we were walked through a tasting of a small amount of their single malt whiskey. While Bryan and I can appreciate scotch whiskey, that tasting affirmed that we are not scotch whiskey drinkers. I had originally thought we would then go for a tasting flight, but we passed. It just isn’t for us—but we recommend you take the tour even if you’re not a scotch whiskey fan! Fairy Glen — This area had no official parking lot, so simply park along a roadside bump out. 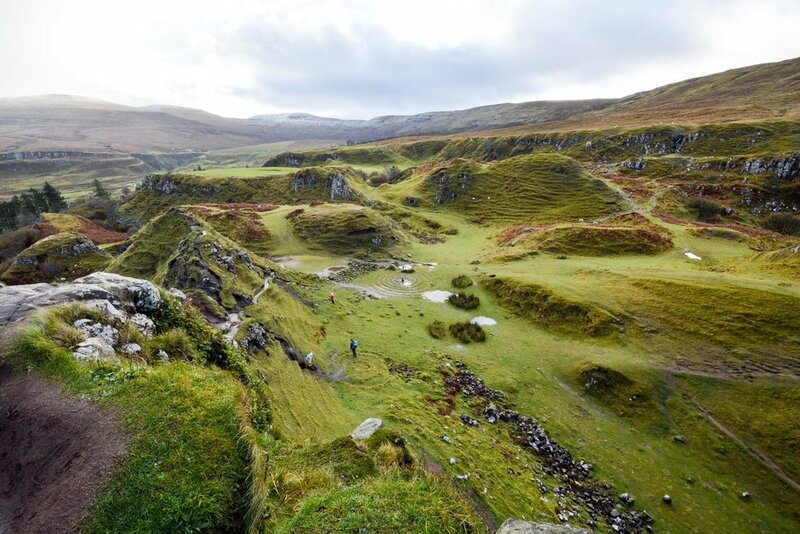 Walking about 10 minutes into the glen you’re somehow magically transported to a world where fairies could be real… Climb up to the Castle Tower ruins for the best view. Good morning from the Fairy Glen! Bryan camouflaged in his environment…can you spot him? Quiraing — Park in the giant parking lot off the road. IF you’ve made it here early enough you will be awarded with no crowds. We hiked for about 2 hours in total, our halfway point at a chainlink fence (which you could easily climb over to continue the hike), but we enjoyed the ocean and rock formation views from this halfway point. Kilt Rock and Mealt Falls — This is more of a viewpoint than a hike, but the viewpoint is at the top of the waterfall looking down onto the water spilling violently over the cliff. Be prepared for tons of other people waiting for their turn to selfie with the waterfall. This area is also is home to kilt rock—a 295-foot high cliff resembling a pleated kilt. Mead Falls and Kilt Rock behind it! Brother’s Point (aka Rubha nam Brathairean) — This hike took us about 1.5 hours. It’s another out and back hike, but we ran into no other tourists and it offered up some of the most gorgeous views! I’ve pinned the small parking area on the map below. Walk south on the road for approximately 400 feet, where you will find a gravel road on your left with a sign for “Rubha nam Brathairean.” Follow the gravel road to the end, passing through the gate, and follow the signs towards a muddy/grassy path which will lead you through sheep pastures and a small waterfall towards a black pebbly beach. walk along the beach, and you will come across a sign warning you about the steep cliffs. Next to a sign, a very narrow trail will lead you across a boggy area along the cliff-side. Walk along but please be careful—the fall is long and painful if you make a wrong step! The end is a peninsula cliff with two short twin rocks (hence “Brother’s Point”). You can walk along the peninsula, but it’s even more dangerous. We were amazed to see sheep had somehow made their way to the tip of the peninsula and were casually grazing. Another interesting factoid about Brother’s Point? Apparently dinosaur footprints were recently discovered there! On the way back, we were pleased to find a giant rainbow across the sky—just for us. Kilt Rock and Mead Falls in the distance! 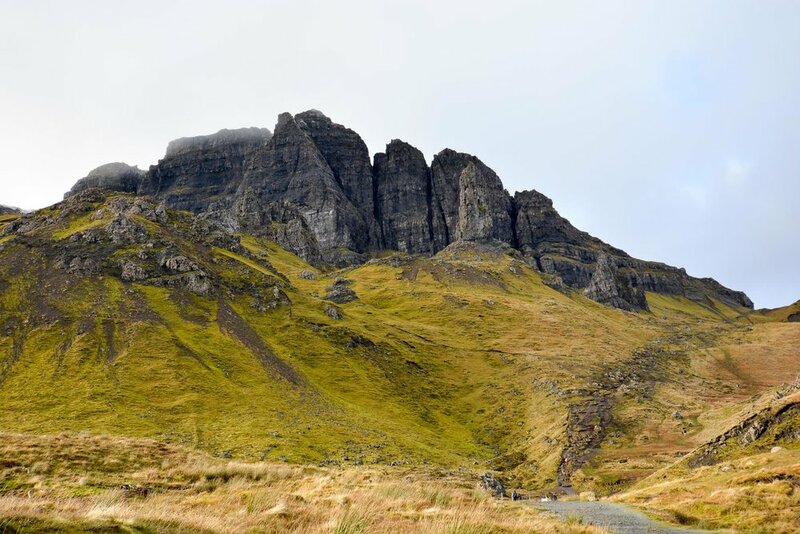 Old Man of Storr — Perhaps Isle of Skye’s most famous attraction, this hike seems short, but is insanely steep. We went about halfway up before deciding the steepness would most likely hurt Bryan’s knee on the way down if we went any further. 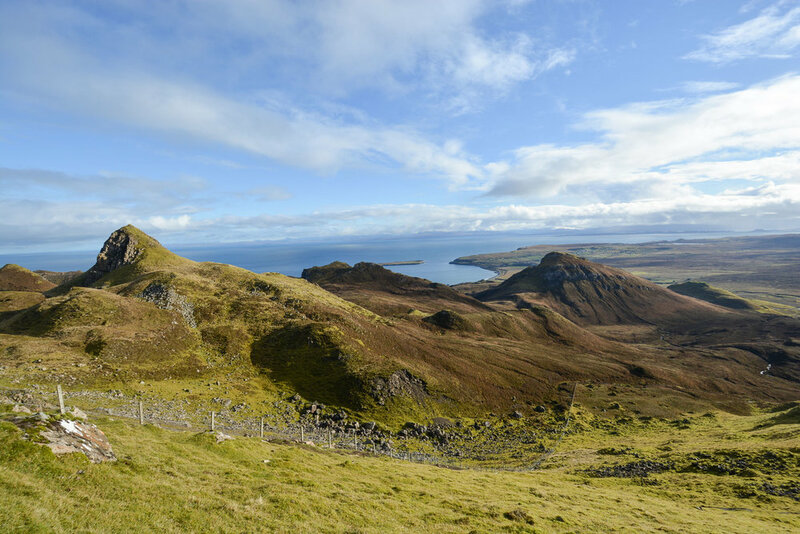 The formations are iconic to the Isle of Skye, so we recommend this popular destination. Bryan and I are travelers on a serious budget, so we use public transportation as much as possible and don’t mind walking 1 or 2 miles to a nearby destination. That being said, there is so much to see, and buses did not go everywhere we wanted to go on the Isle of Skye, so we rented a car for 4 days. Bryan was especially nervous to drive stick shift on the wrong side of the road, but he quickly got used to it. We took it slowly at first, and when giving directions I constantly reminded him of things like “easy left” or “difficult right,” meaning you don’t need to cross a lane of traffic when turning left onto another road, and you do need to cross a lane of traffic when making a right. The roads on the Isle of Skye are mainly country roads that are narrow and have many blind spots. Usually just before these blind spots (either horizontal bends or hills or both!) there will be a sign for a passing place. If the passing place is on your left, it is your responsibility to pull over to let oncoming traffic (or faster traffic behind you) pass. If the passing place is on your right, DO NOT PULL OVER. It is the responsibility and expectation of the oncoming traffic to pull over, so it could cause an accident if you do something unexpected to the oncoming vehicle. Here’s a nice website for some driving tips on the Isle of Skye: Click here.